General Manager of the Holiday Inn Chiang Mai Stella Jacobs congratulated Group Captain Kidkuan Sadub on his post as the new commander of the Royal Thai Air Force Base Wing 41 when he visited the Holiday Inn on December 4, 2013. 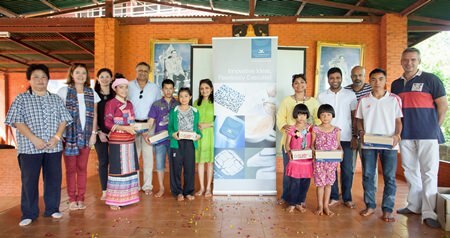 The SilverNeedle Collection this month donated 111 pairs of new sports shoes to the School for Life Chiang Mai, a charity that supports children living in difficult situations in Thailand. The initiative began in late August, when SilverNeedle Collection started a campaign to donate shoes on behalf of delegates at Luxperience 2013. For every appointment scheduled with delegates to the trade show held in Sydney on 2 – 4 September, SilverNeedle Collection donated two pairs of sports shoes to the School for Life. Mr. Jumabhoy and board members delivered the shoes following a board meeting at the award-winning 137 Pillars House Chiang Mai. The board and Mr. Manfred Ilg, General Manager of 137 Pillars House, are seen with School for Life children holding boxes of new sports shoes. Second from left: School for Life General Manager Dominique Leutwiler; fifth from left: SilverNeedle Hospitality MD & Group CEO Iqbal Jumabhoy; first from right: 137 Pillars House General Manager Manfred Ilg; third from right; SilverNeedle Hospitality Board Director Luis Miranda and fourth from right SilverNeedle Hospitality Board Director Mr Sriram Nadathur. Shauna Shattida Pugh of Soho Bar and Guesthouse on Huay Kaew Road celebrated her birthday at the bar on November 30, 2013. Shauna (center) is seen with friends, well-wishers and her partner Krathai at the party. (Photo courtesy of Martin Vanderk). Promenada Resort Shopping Mall held a tree lighting ceremony on Friday, November 29, 2013. The event was hosted by stars Margie and Boy Pakorn as CEO of ECC International Tjeert Kwant lit the tree. The extravaganza featured the stars riding a beautiful old classic car to the screams of hundreds of teenagers and a beautiful tree lit up by lights followed by fireworks and a mini-concert by Budogun. Promenada Resort Shopping Mall is hosting a series of Christmas events leading up to the big day. Here Tjeert is seen with his wife, Promenada executives and friends at the tree lighting ceremony. Central Festival Chiang Mai held the Tallest Christmas Tree in Northern Thailand tree lighting ceremony on November 30, 2013. The event also included a parade featuring Governor Wichien Puthiwinyoo. Orachorn Chanwiwattana, CPN Regional Director said that, the event was organized to allow everyone to have fun and enjoy the Christmas festivities. The 20 meter tree tells the story of Christmas and New Years with a laser morphing show. Wouter Van Der Stichel and Marisa Marchitelli enjoyed the grand opening of the new Jojo Kobe Gallery on Nimmanhaemin Soi 3. The new Gallery featured a series of portraits of HM the King for the grand opening which took place on December 5, 2013. Located in the middle soi between Soi 3 and 5 the Gallery features an eclectic mix of styles and mediums. Jerome Sim (2nd right), General Manager and Pipatphol Phiboonnun (2nd left), Resident Manager of Centara Khum Phaya Resort & Spa, Centara Boutique Collection welcome Panadda Wongphudee (far left), Miss Thailand 2000 and Nattaaon Sopol (far right), 2nd Runner-up Miss Thailand 2012 at the Centara Khum Phaya Resort & Spa as they stayed at the resort while shooting the Burma Calendar 2014.